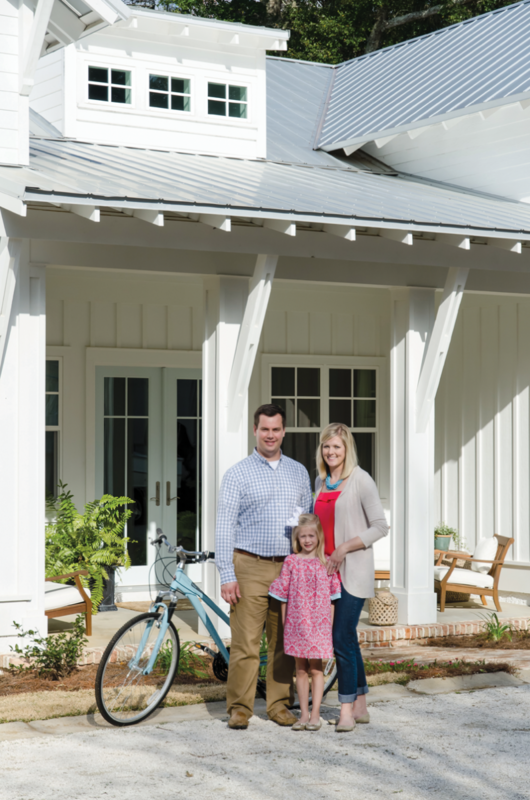 Growing up in Fairhope, artist and residential designer Coleman Mills knew the house that sat in the middle of what is now the four-lot neighborhood that he calls home. “Over time, the old home and property had been abandoned and was overgrown with kudzu. It was invisible from the street, ” he recalls. But he saw potential there and worked with Walcott, Adams, Verneuille Architects to help develop the small neighborhood. 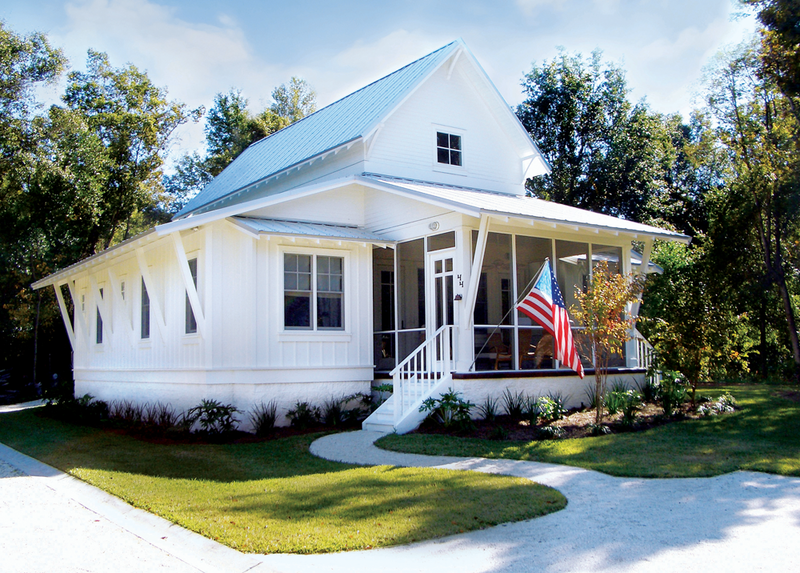 Coleman and his wife, Alix, had gutted and renovated three homes when they decided they were ready for a ground up construction experience. “Over the years, our tastes have changed, and we felt like a new home would be the best way for us to congeal all of those sensibilities into one project, ” Coleman says. So they purchased two of the four lots, and construction began. “It was overgrown with weeds, which made it difficult to visualize, ” Jonathan says. But the couple loved the location and the idea of taking walks and riding bikes by the Bay. 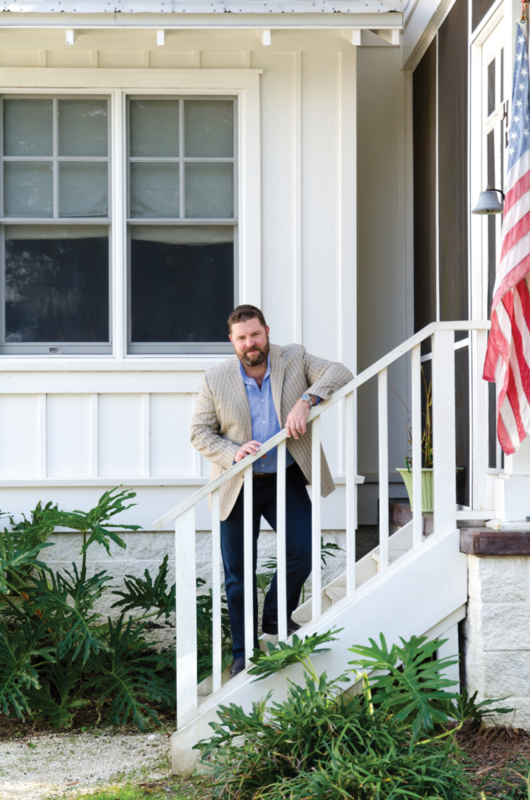 The McKenzies purchased the lot, and Coleman became not only their soon-to-be neighbor, but also their residential designer. 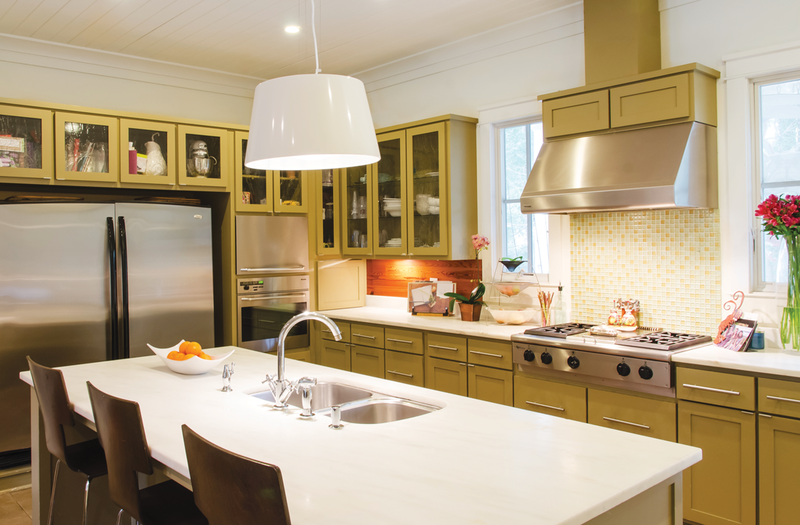 ABOVE Left: Coleman Mills Right: A glass mosaic backsplash hangs above the professional stainless range. 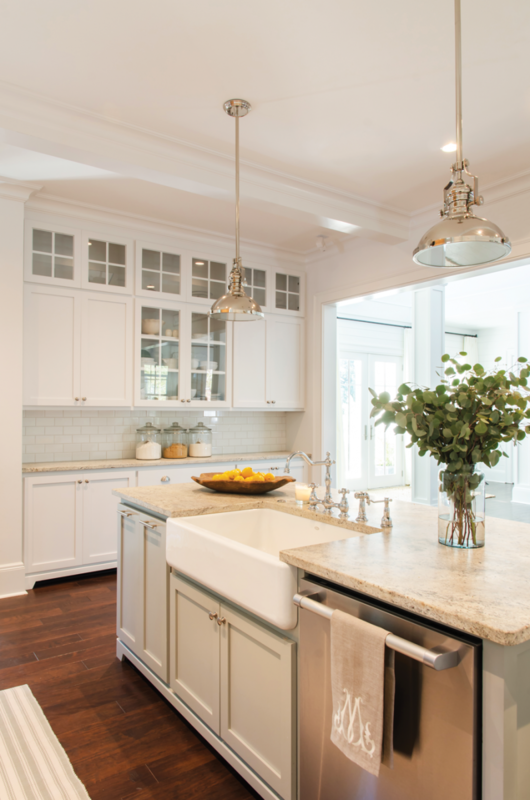 Alabama white marble countertops rest atop moss green cabinetry in the open-concept kitchen. ABOVE Left: Coleman enjoys cooking both on the grill and in the kitchen and loves putting a modern twist on Southern traditional cuisine. 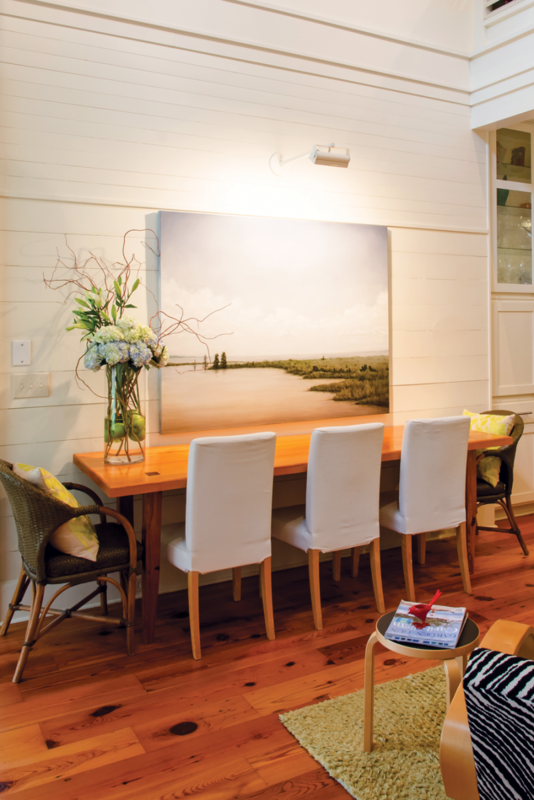 Center: Above the dining table hangs a Brent Smith original landscape painting, which depicts Coleman’s exact position of his first duck blind on D’Olive Bay in Daphne. The table was designed and built by local contractor and woodworker Trey Littlepage. 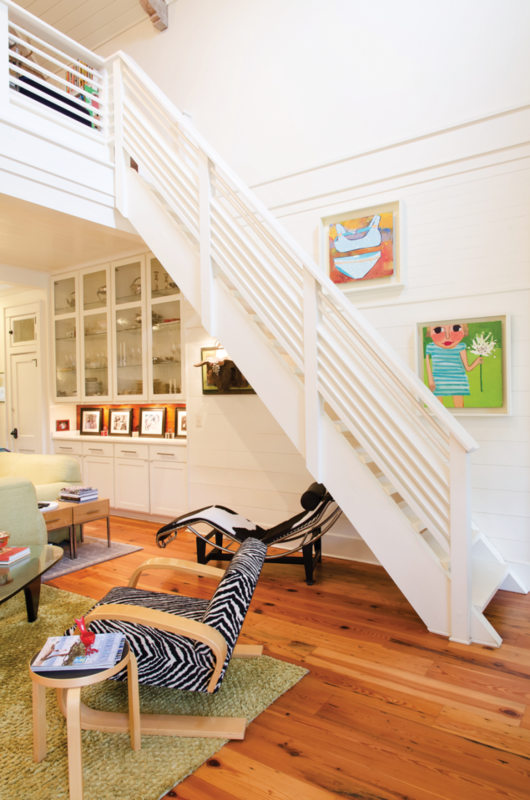 Right: A modern stairwell leads to a loft above the living room. The beams were recycled from a New Orleans warehouse that was flooded in Katrina, and the antique heart pine floors were salvaged as well. Artist Lila Graves painted the two bold, whimsical canvases. 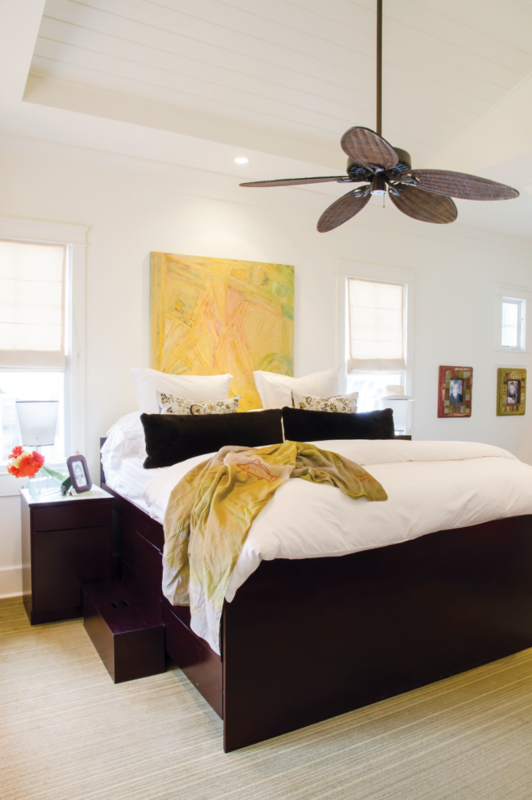 ABOVE Left: Ever the artisan, Coleman designed the master bedroom’s furniture himself as well. His original abstract, entitled “Crop Circles, ” adds a jolt of color when paired with crisp white linens and ivory walls. Center: “To help reduce our carbon footprint and as a way of anchoring the home to its site, both in terms of narrative and pragmatics, we wanted to include as many local, repurposed or recycled components in the home as we could, ” Coleman says. 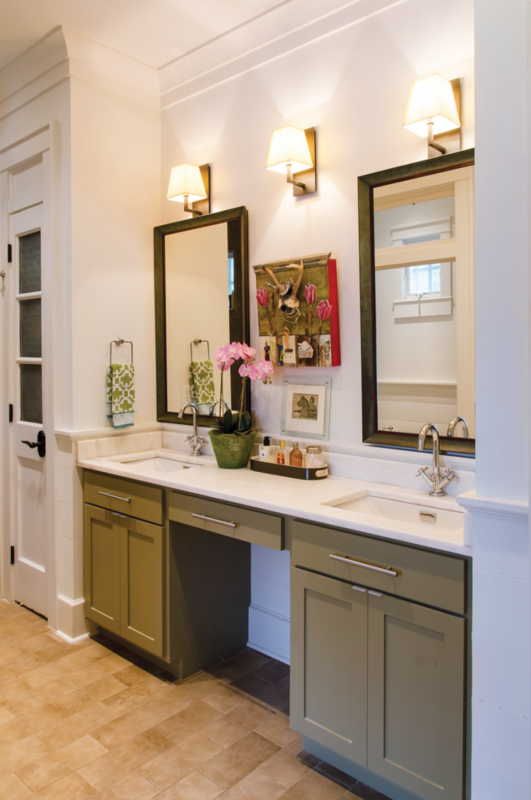 The master bathroom countertop, like that in the kitchen, is Alabama white marble. The collage between the mirrors was done by Alabama artist Sloan Bibb and is titled “Not Such a Good Idea.” Right: “My family and I enjoy organic, free- range meats harvested from my hunting camp, including turkey, wild pig, ducks and deer, ” says Coleman. “We don’t waste a single bit of the animal! 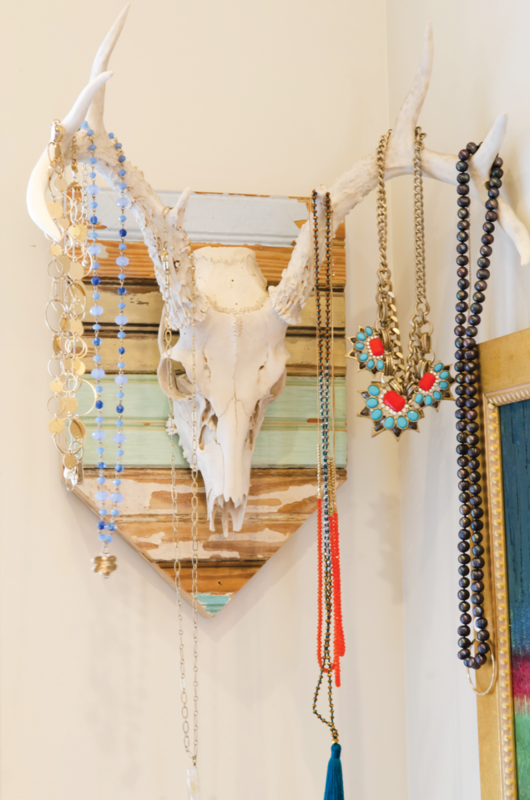 I love the architecture of their skulls, and they make great jewelry holders.” The recycled wood mounting plaque was created by Mike Lyons at the Lyons Share Gallery in Downtown Fairhope. 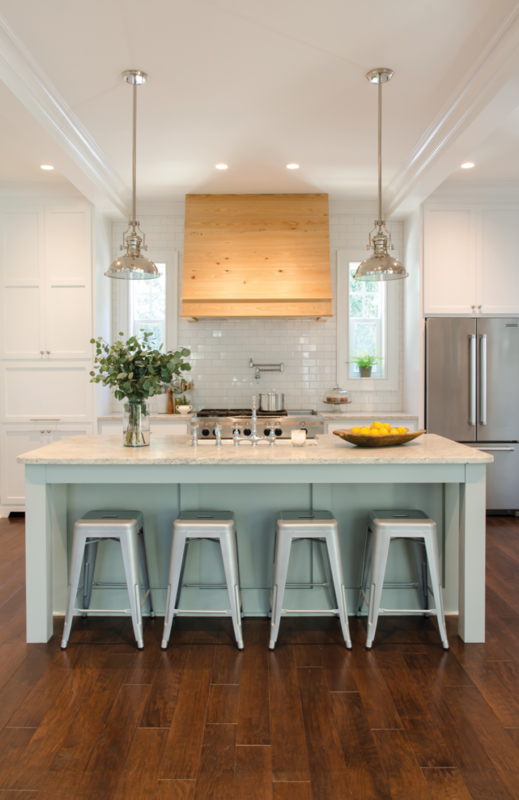 I think people might be surprised to learn that those of us in the design profession experience the same challenges and rewards as any other client building a home, ” Coleman shares. “Walking through the space for the first time and seeing all of the ideas and materials come together is definitely the high point. Budget and schedule overruns are the lows.” Coleman believes that homes are machines that need to respond to how you live life. “Material decisions and style are important but come after the machine has been designed around … your life, ” he says. The Mills have created the ideal home for their growing family, including Georgia, 15; Rosie, 13; Gus, 9; and an English Springer Spaniel named June Bug. “Cisco, a bearded dragon, is the latest addition to our family, ” Coleman laughs. The Mills spend their weekends entertaining, and there’s always plenty of cooking and eating involved, so it was essential that their home function with all of that bustling activity. “The flow of back porch to kitchen to living room allows the house to play very well despite its diminutive size, ” Coleman says. ABOVE Left: Jonathan, Holly and Karidyn McKenzie. Right: Holly, a stationery designer by trade, put her creativity to work, choosing the home’s decor herself. She and Jonathan strapped on toolbelts to create the board and batten, and Holly even painted the art in the living room. 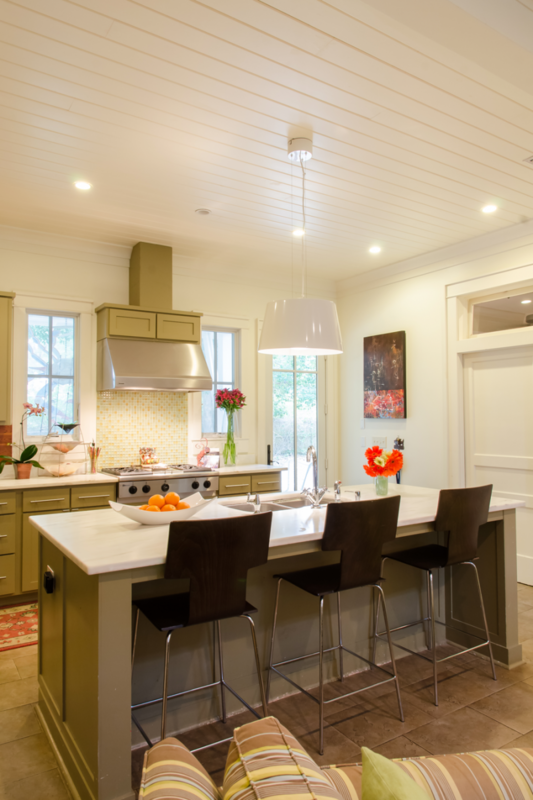 ABOVE A 10-foot custom dining table from Saltaire Restoration anchors the center of the home. Holly fills a planter from White Bungalow in Ocean Springs with orchids from Old Tyme Feed. The rustic candlesticks by Restoration Hardware were found at Antiques at the Loop. 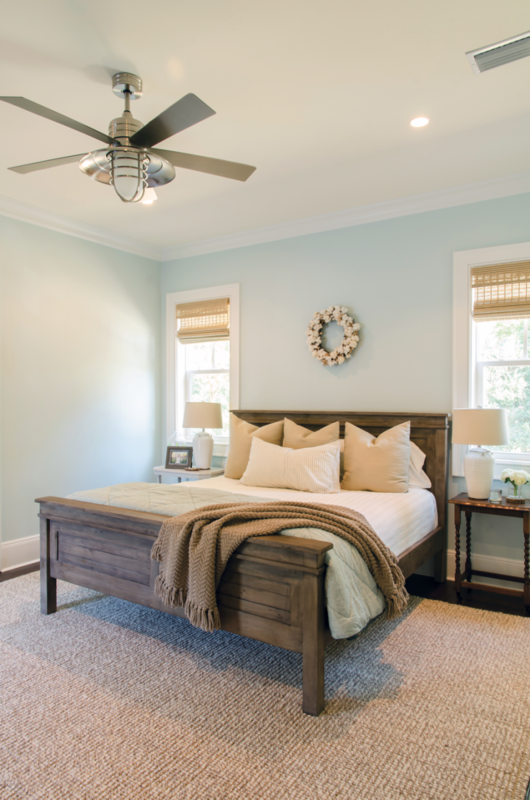 ABOVE Based on their needs, the McKenzies chose to make bedrooms smaller and entertaining spaces larger. Holly collected left-behind cotton from a nearby field and made the wreath that now hangs above the bed. A giant soaking tub is especially elegant when resting beneath a rustic, yet elegant chandelier. 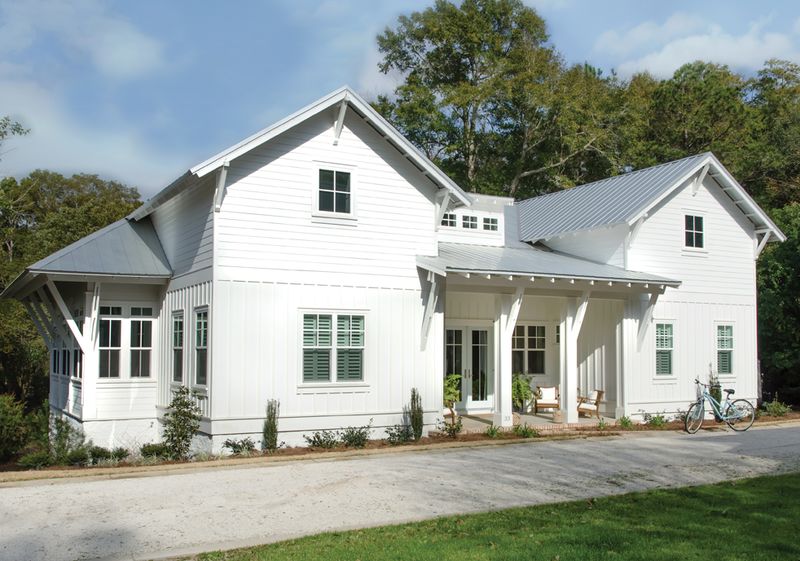 The McKenzies began by making a list of everything they could possibly want in their custom home. “We have always dreamed of building our home in order to try to incorporate as much of our wish list as possible into the house, ” Jonathan says. “We had everything from an office space for Jonathan to a light switch right by the bed so we wouldn’t have to get up to turn the light off at night, ” Holly says. They did do some “value engineering, ” cutting some items to keep cost down, but they plan to add those features eventually, too. 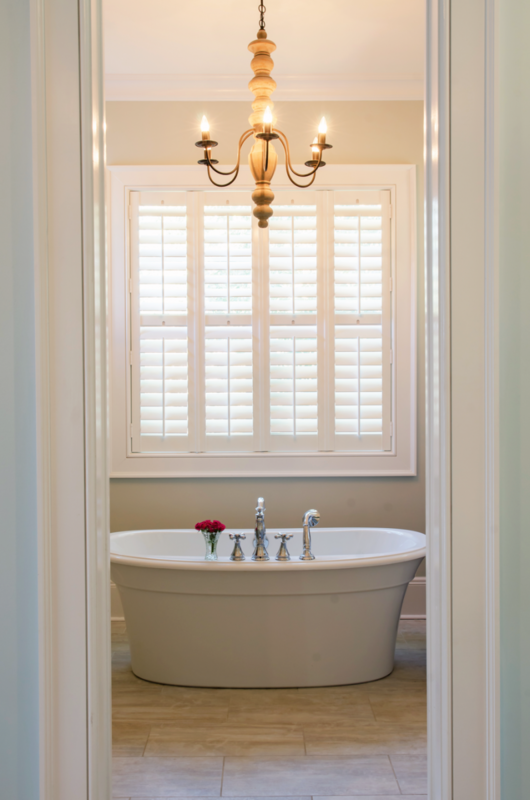 “Coleman is so easygoing and has a wonderful eye for design and attention to detail, ” Jonathan says. 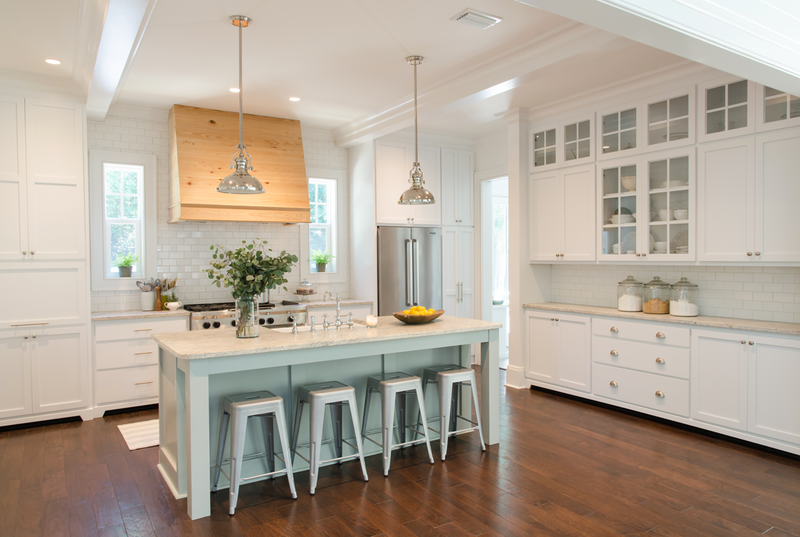 “We bombarded him with photos and ideas for all these features we wanted in the home.” Coleman made suggestions as well, and the couple agrees they knew they had a special, one-of-a-kind home in the making. Jonathan, a wholesale insurance broker, and Holly, owner of the boutique stationery design company HollyDays, both work from home. “Therefore, this house is a huge part of our lives and it had to be something in which we felt comfortable spending so much time both living and working, ” Jonathan says. 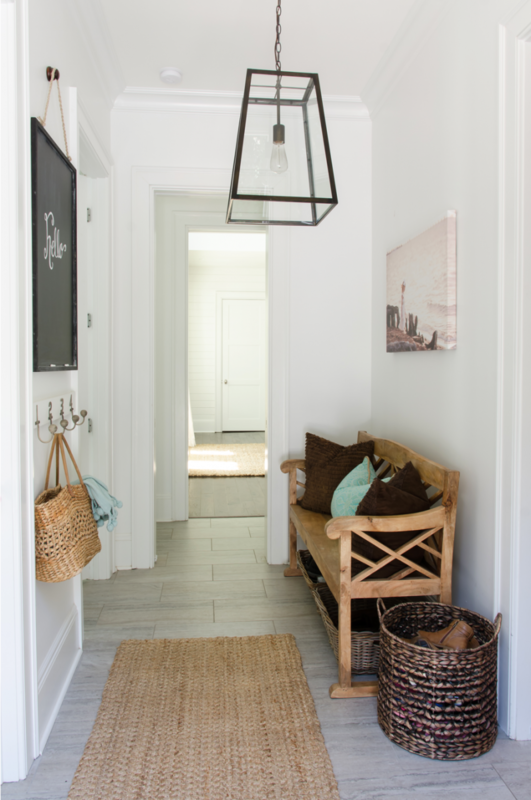 For others who are designing their own dream homes, Holly recommends really taking the time to think about the usage of space and how the decor will factor into day-to-day life. She says that even if it’s beautiful on Pinterest, if it isn’t what you need for your family, it won’t be comfortable or functional. “Since we have a young child (and hopefully more coming soon), little ones visiting our house and lots of dinners with friends, we wanted it to be durable, ” Holly says. 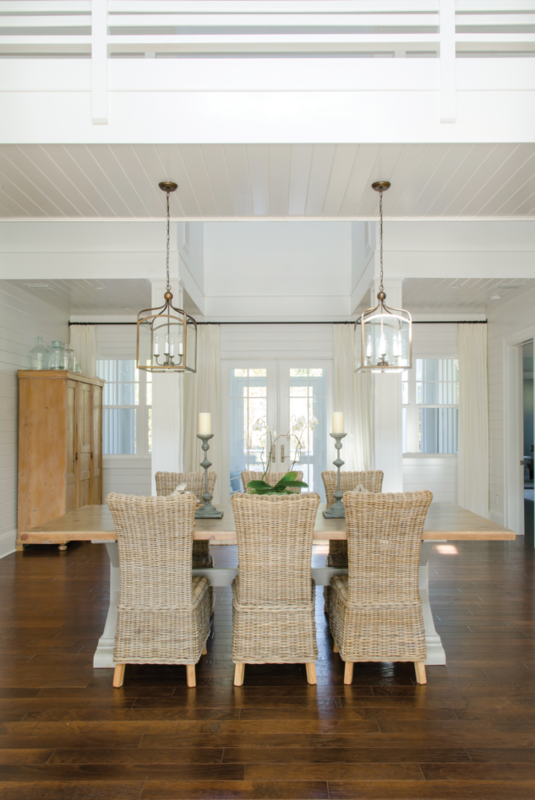 “We have bleachable Dash & Albert Rugs in the living room and kitchen and slipcovered couches.” When they first moved in, she had beautiful white dining chairs that no one would sit in. “It didn’t take me long to sell those, ” Holly admits.